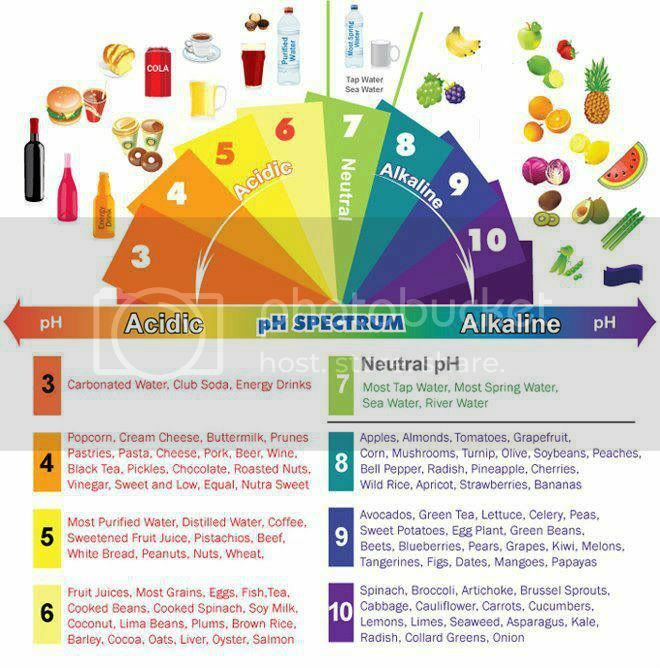 Easiest way to Alkalize your body is by eating alkaline-forming foods. It figures that all the yummiest foods are the worst for you! MM Isn't that the truth! DARN! I heard if you eat correctly 80% of the time, you will be ok... I think. I can't do NO FAT foods, but can live with LOW FAT foods too. A Nutritionist once told me that is how SHE does it! I eat all the wrong things I guess. Although I love tomato juice and citrus green tea. I do eat spinach once in awhile. No meat but lots of cheese, and pizza of course. Potato chips and cheetos everyday. I may die young. I have had cancer three times though. Packy ... please get Mott's Garden Blend. It is the NEW V8 juice!! So much better!!! Slight kick, from a pepper in it, I think. My Dr. friends all drink a glass every morning. They are who started me doing it. I like it so much more than V8. You might have to write to Motts.com and ask them where you can get it. Every store does not have it. I found one. Even if one chain store has it, all the others in the chain might NOT have it. I buy it buy the case - 8 of them. We all know Vegs help prevent cancer and NONE of US get enough Vegs. Thanks, Joni and Rem, for this information. I may try to get the veg. juice because I hardly eat veggies. Packy ... peeking in here with my morning coffee. Always time to help save a life. Food I think is our medicine ... kind of. How about that "famous Holiday Green Bean Casserole"? That's pretty good!! Can use fresh green beans ... (cook first) before assembling in the casserole. Rem ... thank you for putting that chart on here. Going to write it all down. Printer jammed!! Cancer has taken so many wonderful people ... and others ... almost. Green bean casserole sounds good to me. packy... the casserole is good. When I lived in PA and my soon to be lived in OR I wrote that in an email. He started making 1 a week. Lasted a while hee hee for one person too. He liked it. I first had it at a party in the '70's I think. Asked the girl for the recipe - she gave it to me. If you need it, let me know!! Try the V8 'Hot & Spicy'. Oh so good. I love lemons! But so they don't destroy my teeth I buy the squirt kind of real lemon and aim for where the tonsils used to be. I crave it. No, I lust for it! rt that must taste like Mott's Garden Blend. It does have a little "kick" to it. We can't win I don't think. My dearest friend from back home has cancer in her family now. Her 48 year old son has cancer of the tonsils. I never heard of that before. Time to steam Lucy's medicine Her vegetables!! I eat some too with her, in addition to my Mott's Garden Blend! Just got a call ... my case is in. I had to write to Mott's to find out who carries it. www.Motts.com A Safeway. BUT - not ALL Safeways carry it around here. Mott's will tell you who has it if you are interested. Doesn't seem quite as tomatoey ... to me.